This month, I'm talking about eating smarter by choosing foods to help you feel satisfied. 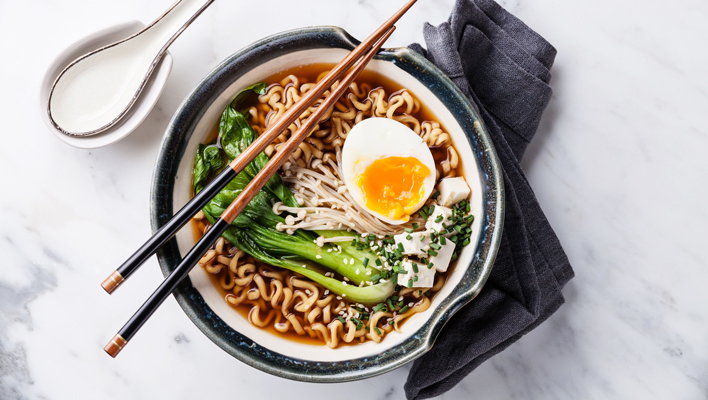 When it comes to meals, there are clever ways to cook – with ingredients that give you a bigger portion without adding extra calories, or you can use a magic ingredient with no calories to help fill you up – water! It's all about energy density. 'Energy density' is the amount of energy (or calories) per gram of food. Foods with low energy density provide fewer calories per gram of food – but they are quite bulky, which means you can eat a large portion with a fairly low calorie contribution as they contain a lot of water – good examples being vegetables. This is what makes them great for increasing the size of meals. Other examples of low energy foods with a high water content are soups and stews. Also foods like pasta and rice that absorb water and bulk up during cooking. Reduce the quantity of meat in your meal and replace with one or two extra portions of vegetables or pulses. 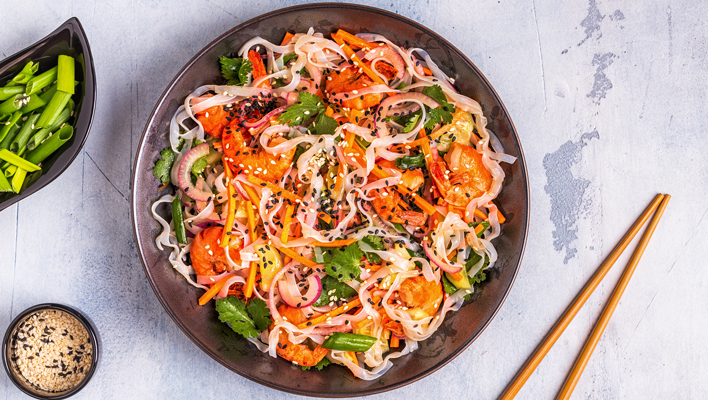 Swap out carbs for a vegetable alternative – such as rice for cauliflower rice or spaghetti for courgetti. 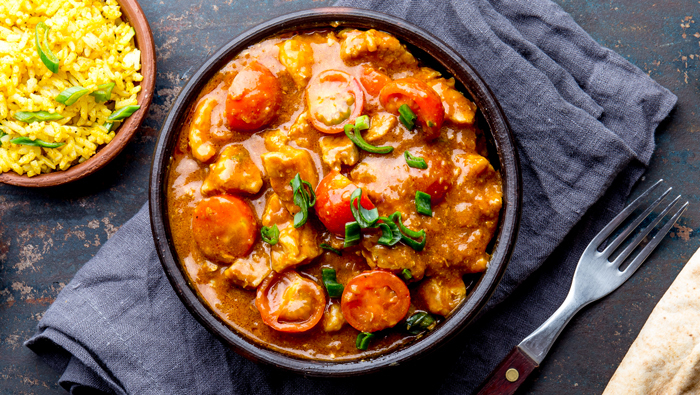 Choose meals that either contain a large quantity of liquid such as soups, curries, casseroles OR foods that absorb a lot of water – rice and pasta – as water adds bulk without adding calories. Don't miss nutritionist Emma's series 'Eat Smarter Not Less'. Week 1 Protein Power. Get 7 protein-packed meal ideas. Week 2 Filling Fibre. 7 wholesome meals to satisfy. Week 3 Super Soups. 7 filling soups. Week 4 Savvy Snacks. 14 sweet & savoury ideas. Place a large saucepan over a high heat, add the sesame oil and heat through. Once the oil is hot, add the onion and cook for 2-3 minutes until starting to soften. Then add the garlic, ginger and chilli and cook for 1-2 minutes. Add the stock cube and water and bring to the boil. Then add the enoki and pak choi, reduce the heat to medium and cook for 5 minutes. Meanwhile, cook the noodles according to the pack instructions. Rinse under cold water and divide between two large bowls. Remove the pak choi and enoki from the pan and set aside. Pour half the broth over each of the noodle bowls. Top with the pak choi, enoki, eggs, feta, spring onion, sesame seeds and seaweed and serve. Place a frying pan over a low-medium heat and heat the Frylight. Add the onion, garlic, celery and carrot and cook for 3-4 minutes until starting to soften. Add the chopped tomatoes, fresh tomatoes, stock, basil, oregano and 150ml water and bring to the boil. Reduce the heat and simmer for 30minutes. 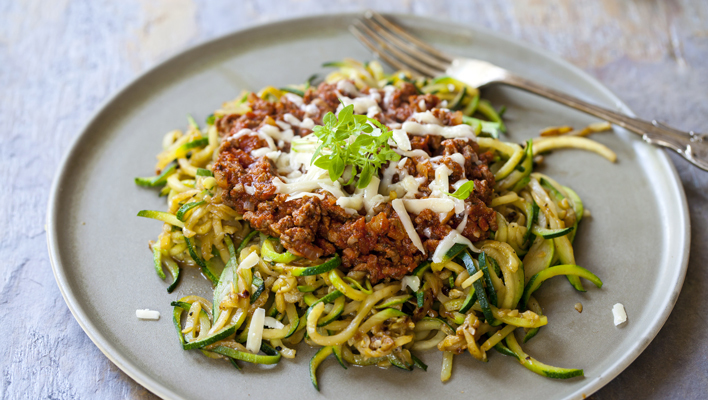 When the bolognese is almost done, cut the courgette into thin ribbons with a peeler or use a spiraliser. Cook in a pan of boiling water for 3-4 minutes. Serve the courgetti topped with the bolognese sauce and parmesan shavings. Lightly spray a large frying pan with Frylight and place over a medium heat. Add the onion, celery, carrot and mushrooms, and cook for 4 minutess. Add the garlic and cook for a further 2 minutes. Next add the Quorn mince, tomato puree, chopped tomatoes, stock cube, herbs and 100ml water to the pan and season well with black pepper. Reduce the heat to low and simmer for 5-6 minutes. After 4 minutes add the spinach and allow to wilt. Meanwhile, preheat the oven to 200°C/180°C Fan/Gas mark 6. Mix 2 tbsp of the milk with the cornflour in a small bowl to make a paste. In a pan add the remaining milk and nutmeg and bring to a simmer. Stir in the soft cheese and paste and cook for 3-4 minutes until the mixture has thickened. Melt in two-thirds of the cheese. Spoon a quarter of the tomato mix into an oven proof dish, top with a quarter of the butternut lasagne sheets, then a third of the white sauce. Repeat two more times. 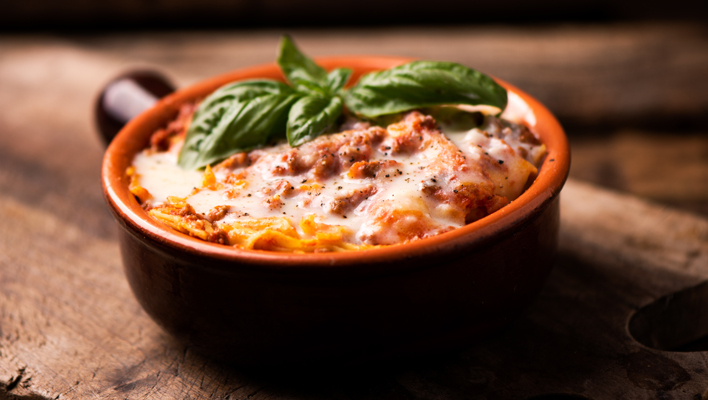 For the last layer, add the rest of the butternut squash lasagne sheets, top with the leftover tomato sauce mix, sprinkle over the remaining cheese and bake in the oven for 25-30 minutes or until the top is golden. Remove from the oven, garnish with basil and serve immediately. Bring a pan of water to the boil and add the stock cube and the rice. Mix together, reduce the heat to medium and cook the rice for 25 minutes. When the rice is nearly done, warm the wraps in the microwave for 30 seconds. Lay each wrap on a plate, top with the salsa, yogurt, lettuce, cabbage and jalapenos. Drain the rice, then return to the pan with the beans and taco seasoning. Return to the heat and warm through for 2 minutes, stirring regularly. 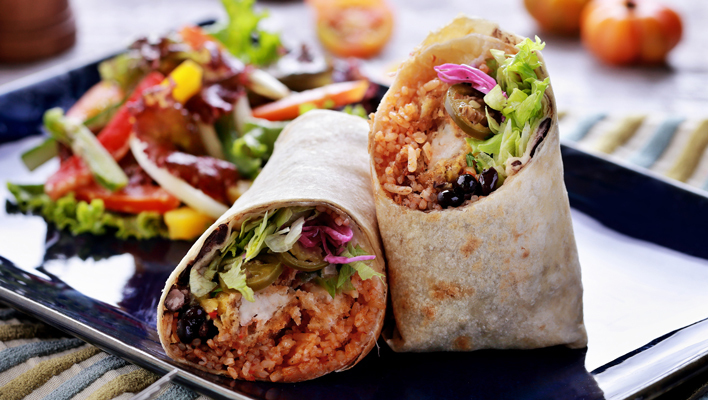 Top the wraps with the rice and bean mix, then wrap up tightly and cut each wrap in half to serve. Serve with a mixed side salad of leaves and pepper slices. Heat the sesame oil in a wok over a low-medium heat. Add the garlic, chilli and ginger and cook for 1 minute. Add the stir fry vegetables, mix well and turn up the heat to medium. Stir-fry for 4 minutes until the vegetables are starting to soften but are still firm. Meanwhile cook the noodles according to the pack instructions. Add the prawns, soy sauce and chilli sauce to the stir-fried veg and cook for 2-3 minutes until piping hot. Add the noodles and mix together until well combined. Serve immediately in warm bowls sprinkled with the sesame seeds and fresh coriander. Mix the chicken, curry paste and half the yogurt in a large bowl. Cover and chill in the fridge for at least 2 hours. Lightly spray a large frying pan with Frylight and set over a low to medium heat. Cook the onion, stirring occasionally, for 3-4 minutes. Add the pepper and cook for a further 2 minutes. Add the chicken and the marinade to the pan and cook, stirring occasionally, over a low heat for 10 minutes until the chicken is cooked through. Stir in the tinned tomatoes and cherry tomatoes, then half-fill the can with water and add to the pan. Cook gently for 10-15 minutes until the sauce has reduced and thickened, then remove from the heat. Meanwhile, put the cauliflower florets in a food processor. Pulse several times until they break down into rice-sized pieces. Tip them onto a tea towel and squeeze gently to remove any excess moisture. Lightly spray a frying pan with Frylight and set over a medium heat. Add the cauliflower and turmeric to the pan with a tbsp water, mix together and stir-fry for 4-5 minutes until hot. Alternatively, microwave on high for 3 minutes. Stir the remaining yogurt and most of the coriander into the chicken curry. Serve immediately with the cauli rice, garnished with sprigs of coriander. 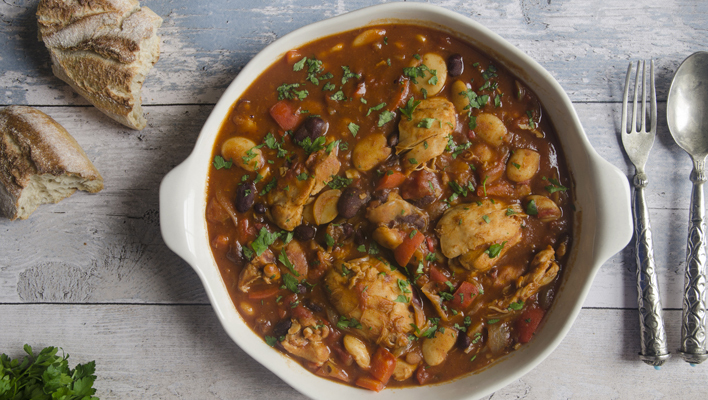 Put all of the ingredients except for the beans, fresh thyme and pepper into a slow cooker. Cook on high for 3-4 hours, until the chicken is cooked through and tender and the vegetables have softened. Approximately 30 minutes before serving, add the beans. At this stage, if needed, use a little cornflour to thicken the stew. Season with pepper and garnish with fresh parsley. Serve with a wholemeal crusty bread roll.